In this review, I will focus on the theory and practice behind properly air cooling a computer. CPU and Video Card Cooling are broad topics unto themselves, so I will save them for another time and another article. Proper Computer Cooling is vital for proper function and longevity of electronic components. Hopefully, by the end of this tutorial, you will be able to properly cool any computer system. A properly cooled computer starts with the case. A good PC Case will provide many spaces for fans in addition to metal construction for heat dissipation. Acrylic cases may look better but they will not cool as well. Aluminum has slightly better heat transfer characteristics than steel (the two most commonly used case materials) but either material will work fine. Generally speaking, you get what you pay for. Look for a case with at least one spot for a hard drive fan, a blowhole fan at the top of the case, a fan on the side panel, and plenty of space in the rear to mount a powerful fan to evacuate all that heated case air. In addition, 120mm fans cool better while making less noise than smaller fans, so pick a case which will accommodate as many 120mm fans as possible. After you have a good case picked out, the next decision for you to make will be between positive and negative pressure. What I mean by this is that there are different benefits and drawbacks to be had depending on whether there is more airflow into a case or more airflow out of a case. With a positive-pressure system (and filtered fans), the inside of your case will stay cleaner because the only air entering the case will be filtered and the extra air that isn’t exhausted by the exhaust fans will blow out through cracks and vents in the case. With a negative pressure system, the vacuum inside the case will pull dirty air in through those same cracks and vents. 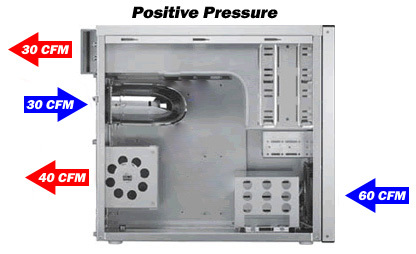 A negative pressure design, however, will result in better cooling because it keeps a constant stream of air moving through the case at all times. The choice is yours, but for this article, since I am focusing on cooling, I will explain a negative-pressure system. Before I get into the actual construction of a negative pressure system, I must say something about the determination of net airflow. When measuring airflow, think in terms of a “CFM-in” to “CFM-out” comparison, instead of a “Number of fans in” to “Number of fans out” comparison (CFM stands for Cubic Feet per Minute). The reason is simple. Different fans, even if they are the same size, can potentially flow vastly different amounts of air. When deciding which fans to use, make sure to note the CFM rating of a particular fan and factor that into the overall decision. After you finish this article, go ahead and browse through our selection of case cooling fans. For a negative air pressure system, the goal is to have more air being forced out of the case than is being forced in. This will create a vacuum inside the case which produces a steady stream of cooling air, and will help minimize dead zones where no cooling air can reach. Remember that air is usually exhausted through a top-mounted blowhole fan and by the rear fan(s). This leaves the front and side for intake fans. Generally, an 80mm-120mm blowhole coupled with a 120mm rear exhaust, plus the power supply fan, will be more than sufficient in any properly cooled case. With a 120mm front intake fan and an 80-120mm side intake fan, this setup will usually produce the desired “negative-pressure” effect. Just make sure that the CFM of the combined outputs of the three exhaust fans is greater than the CMF rating of the combined outputs of the two intake fans. After you have constructed your cooling system, you can test its effectiveness by allowing smoke to be sucked into the case (note: this will only be feasible with a windowed case). If the smoke is almost immediately evacuated, your case is set up properly. If it stays in the case for a while, or if it lingers in the corners without being evacuated, you need to change your cooling setup. Since every case is different, you will just have to experiment with fan placement, power, and direction to get the best airflow. Keep in mind that Xoxide has a great selection of computer cooling goodies available! After that, you’re finished! Congratulations on building a well-cooled machine. Look for articles detailing the specifics of CPU Cooling and VGA Cooling soon.